Ace your hackathon with serious services, APIs and tools. Lots of them! Tools you can add, change, toss out, repurpose, re-repurpose, and otherwise bend to do your bidding. We created Bluemix to be a single-solution environment that lets you develop, test and deploy just about anything you want to make, like those million-dollar ideas you've been hiding from the world. Want to build a browser-based chat app that requires little to no system resources? We have Node.js. Is your boss asking you to scale to billions of requests a day? Do it with Mongo DB. Does Nanna want you to build an app to track daytime soap storylines?You're going to need some message queuing. IBM is supporting Global Urban Datafest Hackathons, focusing on solutions that enable data capture and analysis to address urban issues. 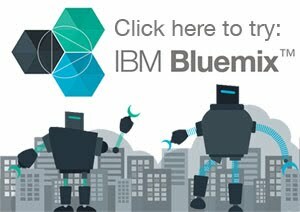 Bluemix has the tools to create a unique and innovative applications for this hackathon, and for your future challenges. So start learning now! Click here to go the Bluemix page. Familiar set of languages including Liberty Java, Ruby, PHP, Node.JS, and Python The right database for you, whether it’s Cloudant , SQL, mySQL or MongoDB Support for Wearables and Internet of Things (IoT) integration. For email, messaging and phone comms, check out Twilio, SendGrid, etc. Instant server resources and infrastructure to develop and deploy Starter code to give you a solid foundation for enterprise-grade coding A full ecosystem of partners and open source services.